Appearance: Rikai has a small build, standing at a mere 4 feet, 6 inches, appearing like a young child with black hair that falls across his face. His mask fragment is situated above his face, with part of it extending downwards over his left eye where it ends in tooth-like shapes. His eyes are a light brown colour. He has a pair of thin diamonds tattooed on his right cheek, and the number 3 upon the right of his chest to signify his rank. His Hollow hole is on the left of his chest, in the standard position, where his heart should have been. He has a long, thin scar running down his chest, crossing over the hole. He does not remember where he got it. He wears a white Arrancar uniform with a black trim and large sleeves that cover his hands. Personality: Rikai comes across as cold, distant, and obsessive. He appears to enjoy the idea of being a 'perfect killer', preferring to avoid fighting with brute force. He is fairly easy to anger, but he does not express his anger in a normal way. He does not allow it to take control of him, understanding that always being able to make pragmatic, rational decisions to be more important. He has never been known to smile, or show actual joy at anything. There are also times when he seems like his mentality is unstable - during these times he is often seen running as fast as he can or killing at random. His greatest fear is the loss of his powers, as his cold personality comes from them. He believes on a subconscious level that if he lost his powers, he would lose his denial - and he would have accept that some of his humanity remains, and face up to the guilt of some of the things he has done. Likes: Running, killing, order, brooding, winter, snow. Dislikes: Fire, disobedience, knives, Shinigami, fools, darkness. Special Characteristics: He excels at mental games such as chess, cards, ect. However, he does not like to play them. Rikai Sentashi started out human, as most Hollows do. He was born in a small town, where he was raised among loving family. He had a mother, a father, two older brothers, and a cat. They were normal. He was normal. On his first day of school, he got into a fight with another boy over a trivial matter. Rikai had always been a strong willed child, quick to anger, quick to resort to violence. However, on that day, he did not triumph. The boy was blinded by his own emotions, and the other took advantage. It was purely an accident that the young Sentashi was knocked against a poorly placed wall. It was purely an accident that he hit his head, and went into a coma. For three weeks. When he awoke, he was no longer a hot-headed, playful little boy. The doctors said he had suffered no lasting brain damage, but he acted differently. He was quiet, calm, and often mysterious. He rarely got angry. His relationships with his family went downhill from that point - he had become distant, not quite the boy they had known and loved. He had few friends, preferring the company of silence. It was not that he did not love his family, or that he liked to be alone. It was just that he often felt like he needed to think. Sometimes, he heard voices in his head, and they scared him. He wanted them to stop. He needed them to stop. When he was eight, his parents divorced. His mother, who had gone straight from a degree in philosophy to the arms of a rich man, was suddenly thrust unceremoniously into the world of work. His father went abroad, where he remarried within a year. Neither of them had time for their children any more. It served to make Rikai worse. He became fond of wandering in a local park, particularly in an open, grassy area where you could watch as the land fell away into a great valley, forming sheer cliffs where an troubled, lonely child could sit and ponder his own existence… and what had happened to his own mind. He would do this every day after school. It became something more than a routine. When he failed to have his hours in the park, it almost hurt. However, as powerful, influential and rich people tend to know, routine can be a bad thing. Routine can get you killed. When he was nine, Rikai died. It happened on Christmas Eve, of all days. His mother was out, working late for little pay, attempting to scrape together some form of Christmas dinner. His brothers were at the arcade, or smoking in an alleyway somewhere. It didn’t really matter. Rikai was in his park, on his battered bench, watching the shifting grey clouds. It grew darker and darker, but he was used to it by now. There was a blizzard rolling in, and a few inches of snow had already covered the grass. It was bitterly cold, and Rikai did not like it. Normally, he had simply shrugged off the temperature and the darkness, always managing to find his way home, as if guided by some instinct or another. Today, it was different. He had a bad feeling. His instincts were telling him to leave, and leave soon. However, children can be stubborn creatures of habit, and he did not want to leave until he had seen the snow fall again, as he knew it would. When it was dark, the snow began to fall once more. And he knew that he was not alone. Except it was not. This is proven when a figure steps out from behind a tree, as Rikai runs. A powerful arm delivers a powerful blow to the face, causing the boy to stagger and fall on his back in the snow. Blinking through tears, he was vaguely aware of a thin trickle of blood running from his nose. He looks up at his assailant. He sees only the flash of steel, reflected by a distant light, before the knife is plunged into his chest. As a soul, Rikai is much as he was in the last third of his life. He simply wandered the park, occasionally crying quietly to himself as his chain of fate slowly eroded. He paid little attention to the people after the first day, when he had come to understand that they could not see or hear him. The police had come first, early on Christmas morning, to find his body lying mutilated in the snow. He did not see his family, when they came to lay flowers at the crime scene. He tended to avoid looking at the living. He didn’t know that he had become the third victim of a serial killer active in the area, and he did not know that his death had only served to tear his family apart more. He knew that he missed his family. He missed the way it had been. One night, they came for him. He thought they were angels, sent to take him onwards. To heaven, or something with eternal bliss... Not even that. All he wanted was rest, from the voices, both inside is head and out. They were nothing of the sort. They weren’t even Shinigami. They were, of course, Hollows. Even just their Reiatsu was enough - the erosion of his chain of fate completed, and, with a great amount of pain, his transformation from sad, lonely dead child to vicious eating machine was complete. He rose up before them, his mammalian form was large and white. The Hollows began to realise this was less of a good idea than they had previously thought… Needless to say, he destroyed them all. He ate them all. There were no voices now. Just the hunger. He ate his family, first, consuming them as easily and willingly as he had consumed breakfast cereal when he was alive. He then hunted humans at random, enjoying the taste of their souls but never feeling quite as satisfied as he had with the Hollows. It was only a short while before he got a taste of something a little higher quality. After all, he could not stay under the radar forever. The fight with the Shinigami was short and brutal. Rikai was lucky to come out of it alive. He had raw power, yes… but not as much. He realised, then. Some part of him realised. Raw power was not enough. You had to be cunning. And that was how he won, feasted, and grew stronger. Some part of him understood that Hueco Mundo was the place for Hollows to be, and, after a while, he began spending all of his time there. He no longer needed to consume humans. Hollows were much tastier. Eating, from then on, became the main part of his life. He wandered the sands, killing, feasting upon the souls of the slain. Eventually, of course, a change came upon him. The powers of the Hollows he had consumed, combining with his own… he became something new. Something large. For years, he roamed the sands of the desert and among the crystalline trees of the Menos Forest. His life became almost monotonous. He was free of the shackles of individuality, but had settled into a routine that was even more dull than sitting in a park watching clouds every day. Kill, eat, kill, eat, eat, kill, kill, eat. However, Rikai was the dominant force within the Gillian. The mask they wore was not the standard. They had the potential. That was when evolution came again. Adjuchas. Smaller, stronger… better at thinking. More capable. Capable of killing cunningly, exquisitely, perfectly. Rikai liked this. Not that he remembered now, but his fights, in the past... On his first day of school, against the boy who had stolen his crayon… the day he killed his first Shinigami… and even the day he was murdered. It was not that the serial killer had been powerful, although it wasn’t exactly hard for him to overcome a frightened nine year old. It was that he had been clever. He had watched the boy for weeks, planning, before finally striking. Although he did not remember the events, he had learned the lessons. He had become known, to the Shinigami, by a nickname. ‘The White Beast‘, they called him, and it eventually became the codename assigned to him in all official documentation. Not that he appeared in the Gotei paperwork very often. Rikai found that it was often better to maintain a low profile. However, he had experienced a few run-ins with the Gotei in his time, as was inevitable for someone like him. The most notable of these occurred when he was close (although he did not know it at the time) to the final stage of evolution. They had come to the Forest of Menos, where few Shinigami dared to tread. They were an elite expedition, and they were led by a Captain. Rikai had led the defence, in a way. He had commanded the mindless Gillians, slowly picking off the weaker members of the Shinigami team before attempting to pull a master stroke. He had surrounded them with the Gillians, lots of them, and another Adjuchas had emerged to fight, too. It was the push he had been going for, to get the Captain to reveal his true power. Bankai. And the Captain had played along, releasing her Zanpakuto into its most powerful form. He had watched, as she destroyed the weaklings with a burning sword and a simple trick of the eye. He watched and waited for his moment. He saw her weakness when a Gillian came at her from behind, and it was lucky that he had. He had moved. She had dispatched most of the Gillians, and was focusing on the Adjuchas that challenged her. Just as she tricked it as she had done so many of the weaker, just as she had cut Rikai’s fellow Menos down with her sword of fire, The White Beast had charged her from behind, taking advantage of her distraction and her weakness - which he had discovered to be a dimming of her vision caused by the brightness of the flame and the nature of her illusion. She had turned quickly, raising her weapon, but somehow Rikai had managed to force it to the side as he slammed into her with all his power, tearing flesh from bone with his powerful claws and head from shoulders with his powerful jaws. In an instant, it was over. The burning sword fell to the ground, shattering into a million tiny fragments, still glowing a faint orange. Of the eight Shinigami that had come to this place, two remained. Rikai had killed one, consuming the soul as he had with the Captain. The other he had allowed to live, for a short time, just long enough to send a message back to the Seireitei about what had happened. He wanted the Shinigami to know that they were not all powerful. The message was, apparently, received. Nobody from the Seireitei ventured as deeply into Hueco Mundo for a long time after. Rikai had learned once again, from this battle, another thing that he lacked. This time, it was speed. The Captain, the woman whose name he did not know, had almost killed him despite his cunning and his power. He needed to be faster. Soon after, evolution came again. Vasto Lorde. Smaller, stronger, smarter. When he had attained this stage, Rikai had retreated into the depths of Hueco Mundo, continuing to eat, to train himself. In his smaller form, little bigger than he had been as a human, he found it easier to increase his speed. He knew he would reach a limit. Eventually, he did. He was at the zenith of his power as a Menos Grande. There was only one way he improve, from here. Weighing up the risks, Rikai decided he was going to go for it. To become the perfect killer… he had to do it. Oh yes, he liked this. The Hollow liked this. He was small, but he was fast. His powers were sealed in a sword. It was then that he took the name for the first time - Rikai Sentashi. He did not know where it came from, he just knew it felt right. It was not the name he had been born with, when he had been human. He does not remember what that was. He remembers almost nothing. The newly made Arrancar began, once more, to lead a nomadic life. However, despite the new strengths that Rikai had obtained, weaknesses crept back. In this form, he was more human than he had ever been, and with that came emotion. He did not realise it, he buried it, he denied it with every part of himself, but they were there. Fear, for instance. If all of his power had been stripped away, you would have, basically, a frightened child. He was also lonely. He had once had family. He missed them. However, he didn’t know that he missed them. He didn’t remember them. But the emotions were there, buried deep. They affected his actions, in tiny ways. The voices were there, too, mere whispers that he rarely heard. And when he did, he dismissed them, and blocked them out of his conscious mind. He began to gather a new family. Hollows would travel with him for protection, although Rikai was just as likely to kill them as others, if he was having a particularly bad day. Eventually, however, he found a place for himself. He saw it as like being a soldier in an army, but a small, sad, lonely and very human part of him saw it as being part of something… a family. In the great desert of Hueco Mundo, a small reptilian creature was snaking its way across the white sands. The moon shone brightly, full tonight, which served to brighten the vast waste that was home to the Hollows and also to signify that it was the new moon in the World of the Living. A light breeze blew, mixing up the sand but somehow failing to provide any air that a human would call 'fresh'. The creature, a Hollow of course, was fleeing from pursuit. It was panicked, looking around for any form of reprieve from the chase, but the crystalline trees that dotted the desert offered no shelter. A man, all in white with an ugly chunk of mask on his face appeared in front of it, the silent air echoing with the familiar boom of Sonido. His leg swung forward, causing the little Hollow to go tumbling across the sand. Two other Arrancar arrived, laughing. They were Numeros, not particularly powerful, and this was more like sport to them than an actual wish to devour souls. Two of them were rather surprised when a thin metal blade swished, bisecting the most powerful of the trio across the waste. The third was not surprised. He was dead. A high, cold voice rang out as the Arrancar collapsed, his body tumbling to the ground. "You were ordered to remain in Las Noches," it said, referring to the gargantuan fortress that was on the horizon. "You were not ordered to go out and hunt Hollows so pathetic you could probably kill them with your spiritual power alone." The voice was high pitched and childlike, but combined with the sight of the figure, it was enough to make the two remaining Numeros recoil in fear. What idiots... Rikai mused as he surveyed the ugly pair. They would be punished for this. He would see to it personally. "It was lucky for you, that you are not Fraccion of mine. If you had been, I would have killed you all on the spot." "P-please, sir, have mercy..." begged the one who had kicked the Hollow, falling to his knees. "We didn't mean anything by it, it was just a bit of fun..."
"Silence!" Rikai shouted. His voice would have sounded odd to any human, small and squeaky like a child but loaded with authority. "You are such pathetic idiots that you are unworthy of even being punished by me. You will return to Las Noches, turn yourself over to the first Espada you see, tell them what you did, and beg them to give you what you deserve. I will hear if you do not, and you will die." "Y-yes sir... of course..." said the kicker, looking close to sobbing. His companion was made of sterner stuff, simply nodding silently. It was clear that he was embarrassed. Rikai snapped his fingers audibly. "Go, then. I do not wish to look upon you any longer." 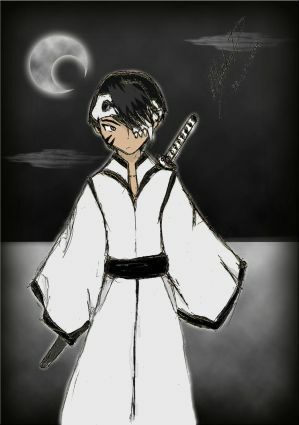 As they scurried away, the boyish Arrancar turned to face the moon, letting out a tiny sigh. His eye was caught by sudden movement to his right, and he inclined his head to see the snake like Hollow that had been the target of the fools. Taking a few short strides over to it, Rikai crushed its head under his boot. "I will never know why they even bothered. That wasn't worth it at all..." his voice had fallen to a quiet murmur as he spoke to himself. Shaking his head, he set off on foot at a regular pace. Just another night in the desert... he thought to himself. Except it's always bloody night here.